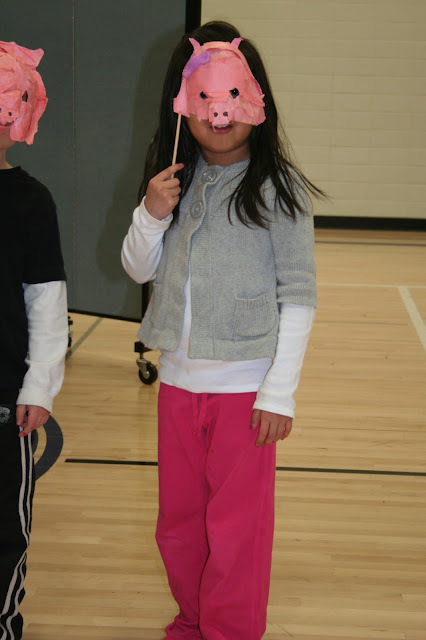 Yesterday, EJ's kindergarten class performed the Three Piggy Opera for family, friends, and the rest of their school. They did a great job and I was really impressed. They sang all the action and I loved that EJ's friend who played the Big, Bad Wolf could not stop grinning (just like he always does). Not very intimidating, but super cute. It seems a million years ago that Jack was doing a kindergarten performance featuring some little piggies, but it was fun to be back watching a new kindergartener strut their stuff. We were very surprised to walk in and see that our girl was one of the piggies. For the last month or two, we have heard her talk constantly about her role as the big, bad wolf. 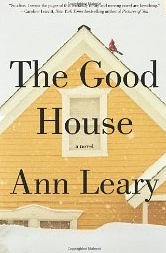 She knew all the songs, she would show us how to approach each house, and of course, how to blow them down. She told us all about how there were so many kids in her class, that there were 3 narrators (true), a family of pigs (true), 3 pigs in houses (true) and 3 wolves (not so much). Turns out that she wanted to be the wolf so much that she invented a story about being the wolf. I think in the end, she may have even believed she was the wolf. I mean, she had me send her to school in all grey and black for her wolf costume (luckily she had hot pink pants in her extra clothes box at school). In the end, she was proud of her role as the little sister pig and we had a lot of talks about telling the truth. And last, but not least, the opera was a big event for me as well. It marked my first couple hours of living without the electrode machine. I had joked that I was going to wear all my necklaces "Mr. T-style" to mark the occasion, but instead went simple. I still feel a little like I'm just breaking the rules versus being off the machine for good, but I'm excited just the same! My niece recently turned 8 and on her wish list was earrings (she is the first of the cousins to get her ears pierced, so it's a pretty big deal). I went a little crazy browsing post earrings on Etsy. There are so many cute styles for kids (the ones on the top left look like Oreo cookies! ), but I eventually reeled it in and just got her a few pairs (the earrings above are from Tizzalicious and Aquarian Mind). I had also seen some great earring holders that looked like picture frames while I was browsing, but they all seemed too grown-up and adult. So, I decided to make one myself. I purchased a plain wood frame (unfinished, post-stand, one dollar) from the craft store. Then I painted it with some silver acrylic paint I already had and finished it with a purple glitter acrylic I bought at the same craft store. The letters were pre-painted with the cute designs (craft store as well) and just waiting for me to hot-glue them to the frame along with the bow (ribbon from my stash). The final thing needed was the plastic mesh for inside the frame. I found a really fine mesh option in with the larger plastic canvas, and it was the perfect size for earring posts. I hot-glued it in the frame and then used the backing posts (the metal brads that bend in the back of the frame opening) for support. We All Scream For...Frozen Yogurt! 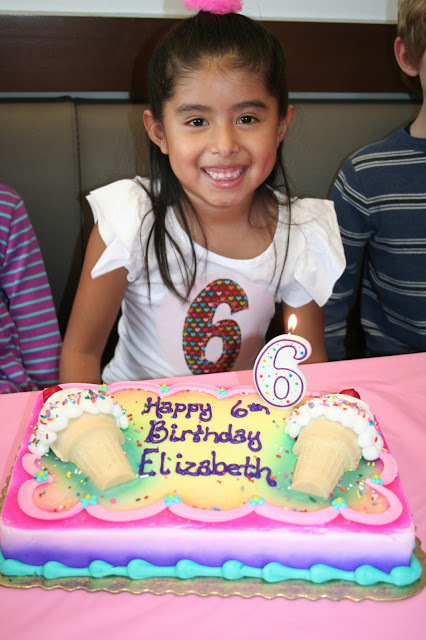 My girl turned 6 last week (I'm still in a bit of shock) and we had a birthday party for her friends at our favorite frozen yogurt shop. She hadn't had a friend party in a couple years, so she was thrilled to plan this one with me. I truly believe every good party begins with the invitation and we knew just who to call for the perfect invite! My good friend Nellie, the creative genius behind nellie*design, dreamed up these fun invitations, matching thank you notes and favor tag bags. 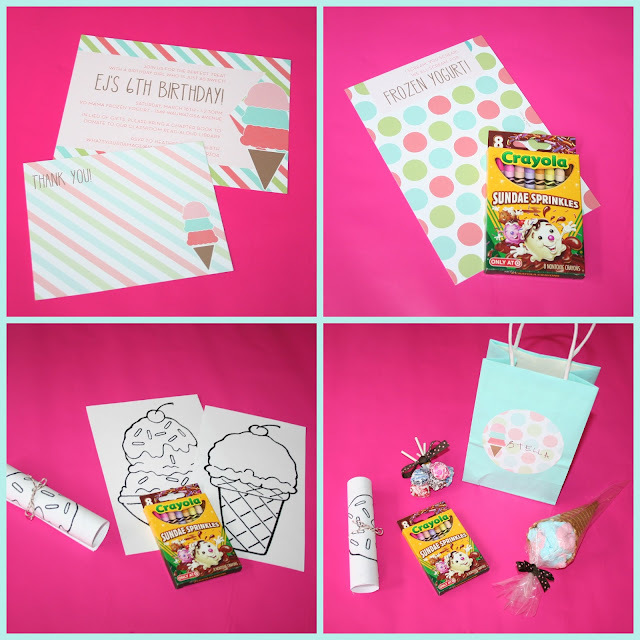 I found some cute ice cream coloring pages (free printables) on the web and stuffed them into the favor bags along with ice cream-themed crayons, a Dum Dum sucker bouquet (EJ's favorite treat) and cotton candy cones (inspiration here). I'd like to say thanks to Alyson, Cyndi & Cathy for tracking down the crayons on my behalf. 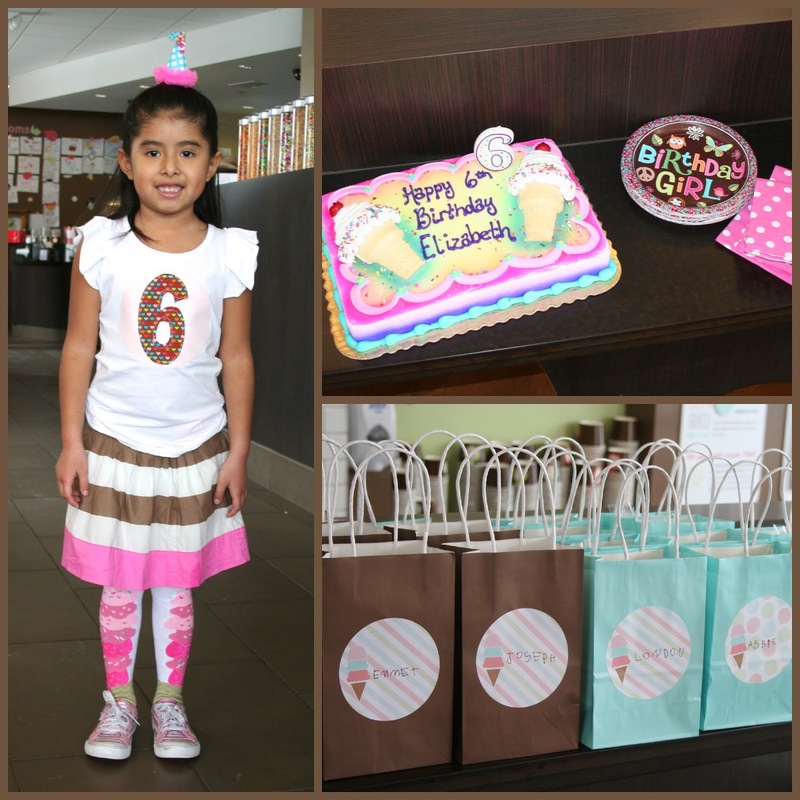 EJ had the perfect outfit for her big day starting with an awesome custom #6 tee from another talented friend, Karri of Green D Designs. I found a cute party hat hair clip at a local boutique and the neapolitan skirt & ice cream cone knee socks at Target. Super cute and she felt so special too! The cake was done at our local grocery store bakery. They cut an actual ice cream cone in half to create the cake decorations. The colors they used were all her favorites as well. 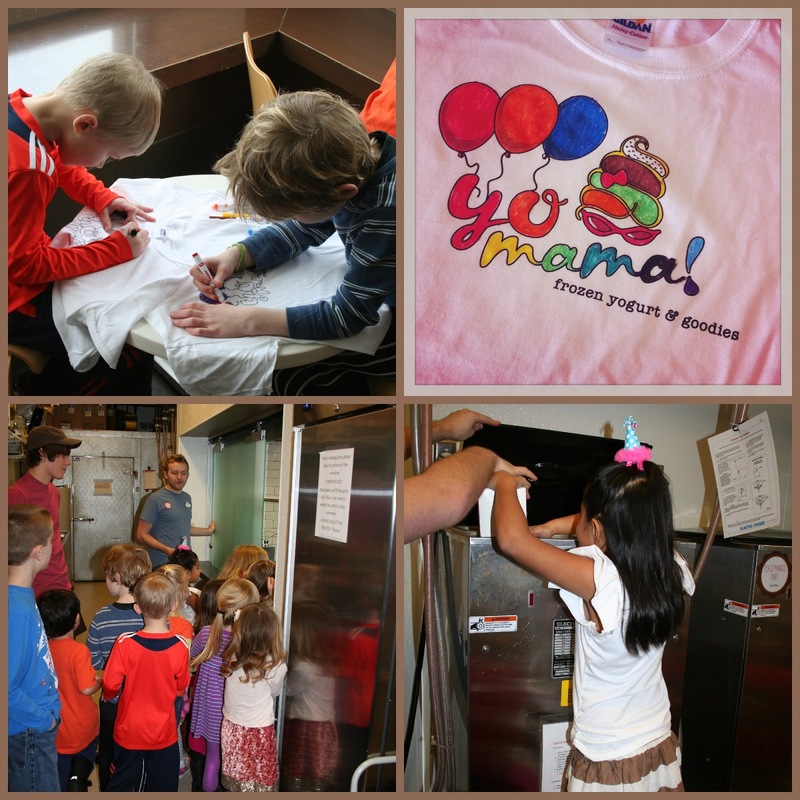 The kids had a lot of fun coloring t-shirts to take home, playing games (which Matt made up on the fly to fill downtime), touring the backroom & walk-in cooler. EJ even got to pour one of the flavors into the machine and everyone took a turn with the dish sprayer. And of course, they each created a gigantic frozen yogurt sundae! 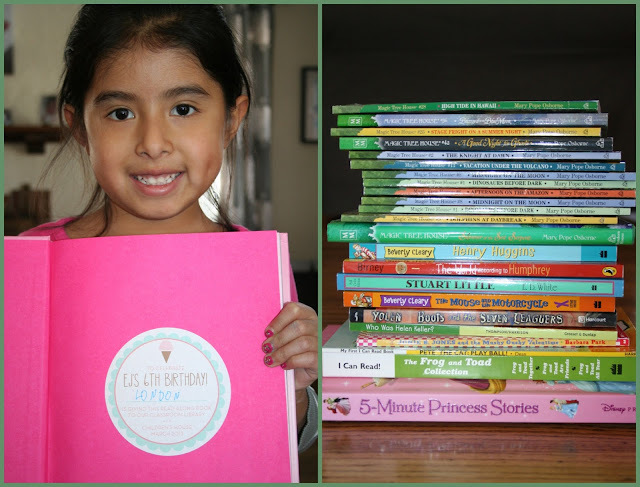 In place of gifts, EJ asked her friends (most of which were classmates) to bring a book to donate to their classroom library. 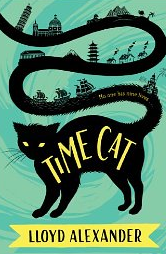 The teacher reads to them every day after recess and I think it is EJ's favorite part of the day (especially recently as they've been reading the Little House series). 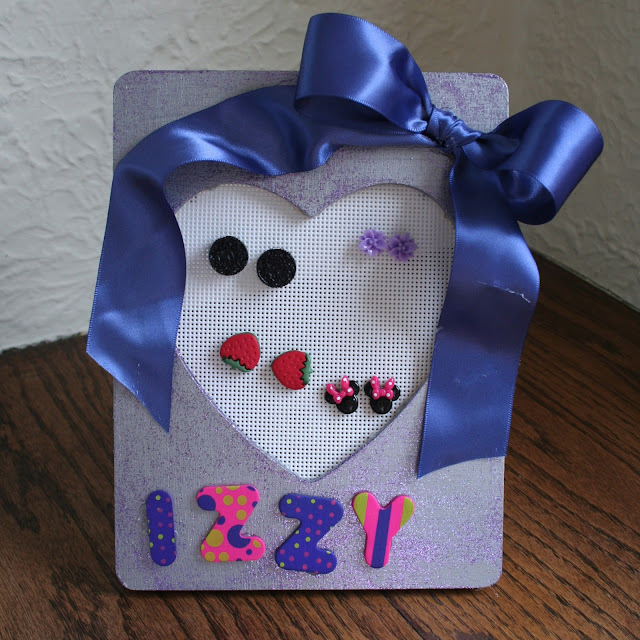 Nellie created these great bookplate stickers and each child wrote their name in the book or books that they donated. It was special for EJ to deliver her gifts to the classroom and I think it will be special for each child to see their contribution to the class as well. The party was a huge success! And it's always great when you can leave the mess outside of your house too. Our next friend party will be for Jack's 10th...I'm thankful for the 6-month waiting period before double-digits. 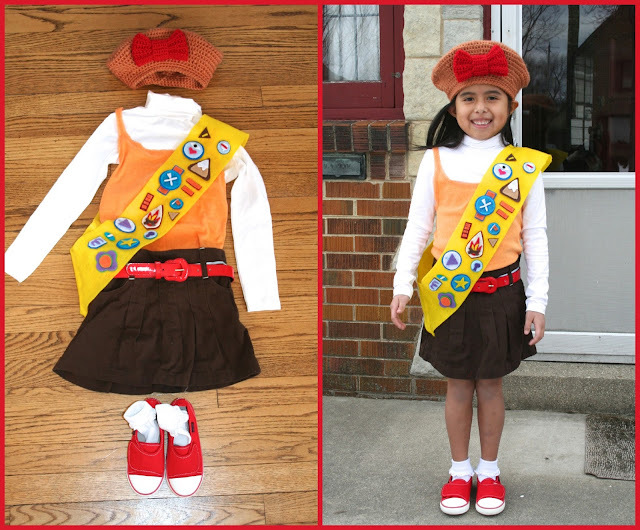 In addition to cheerleading and dancing, EJ dreams of being a scout (I'm not a bad mom, there just isn't a scout program at her school). So, Isabella from Phineas and Ferb is a character that she idolizes. 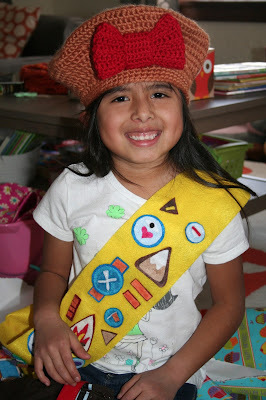 EJ and Livie use bead necklaces (dollar store/mardi gras style) as sashes every time they dress up, so I thought a full Isabella as a Fireside Girl outfit might be a fun birthday gift. 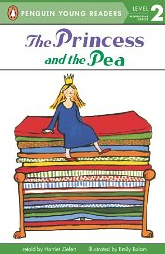 If you aren't forced to watch this cartoon all the time, click here to get a glimpse of the original Isabella. Most of the outfit was found on ebay and some were sale/closeout items (it is surprisingly hard to find a turtleneck in February). My favorite part is the hat which I made myself. I worked from a pattern, but used a much thicker yarn, so had to improvise a little bit. Luckily, Olivia and EJ have the same size head, so I was able to do lots of fittings with Liv to make sure it would fit EJ. 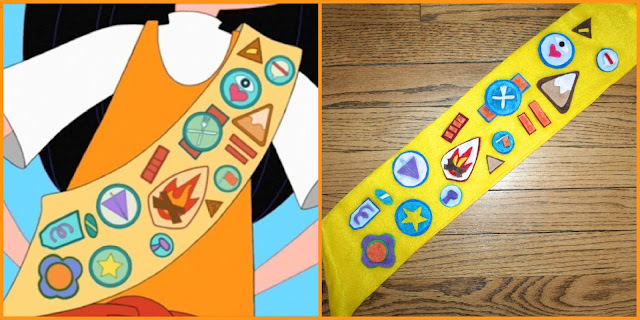 I found a felt sash on ebay and then cut all the patches in craft felt. A friend recommended Sobo glue which worked really well although I got kind of impatient about it sticking and kind of flooded the glue a bit. It does show in some places (mostly due to my using so much), but I know it will stay together as EJ plays with it! 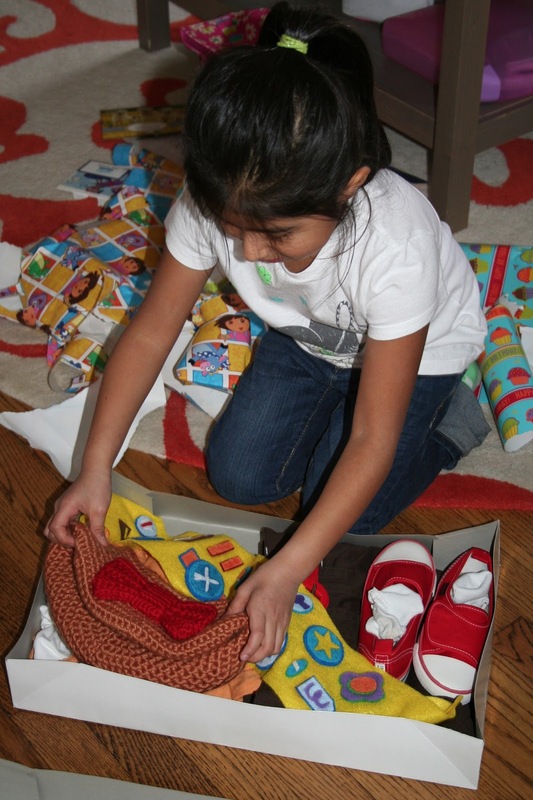 Best part of the process...watching her open it, yell Isabella, and start putting it on immediately! I have no idea why, but I recently decided I should search for poncho patterns. Like I said, I have no idea why. 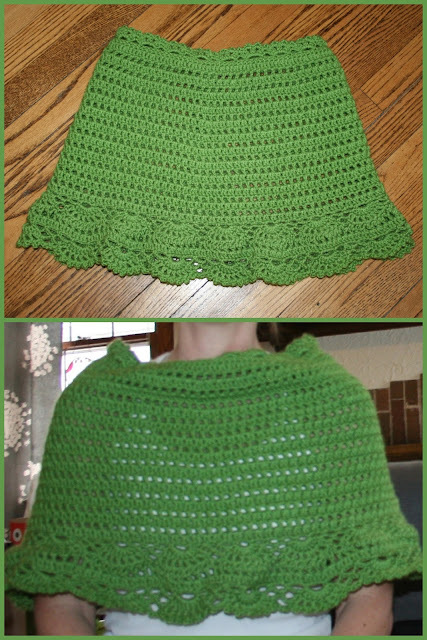 So...for the last couple nights, I made myself this green poncho. I'm going to test it out on Sunday for St. Patrick's Day brunch, but I thought the green color was nice and springy. The girls said it looks like a skirt (a very open skirt I guess), but it's not. Excuse the terrible photo, I'm in workout clothes with no makeup & Liv used the big camera to take my pic). Next up...this poncho or this poncho/skirt for Liv and EJ. 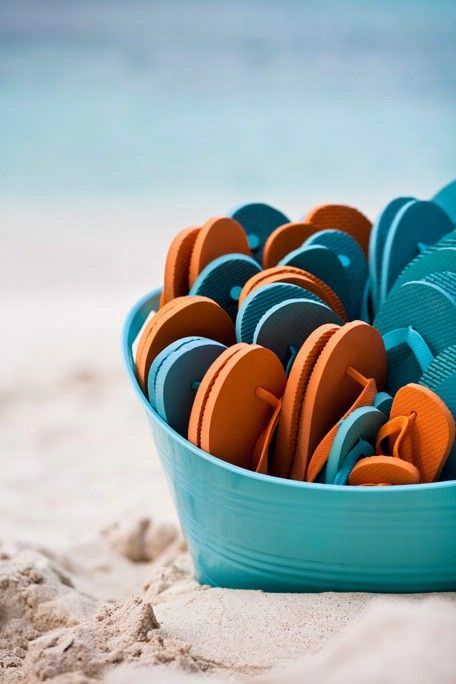 Yes, I am aware that no matter how many sparkles I have on my flip flops, they are still rubber beach flips. I know they are not fancy or cute or great for my feet, but I love them just the same. However, since my spine surgery, I have been pondering what to do this summer. My usual cheapo Flips have no support for my now healing back. I also have a tendency to slip and fall (sometimes down flights of stairs) when it is wet outside because in addition to no support, they have no tread either. But the thing is, I'm just not willing to give them up! I don't want to wear shoes in the Summer (or the Spring or the Fall either for that matter). So, I need your help, please. Can anyone recommend flip flops that are cute (as cute as flip flops can get, I guess) but also might have some support and tread? Please! It's Monday. This house has had a particularly rough weekend. I'm seriously in need of extra DC. And I'm beyond thankful to those that "complete me" and help soften the edges of life! 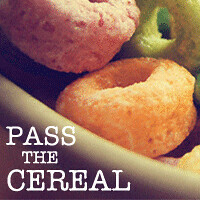 The printable above is from Lolly Jane. 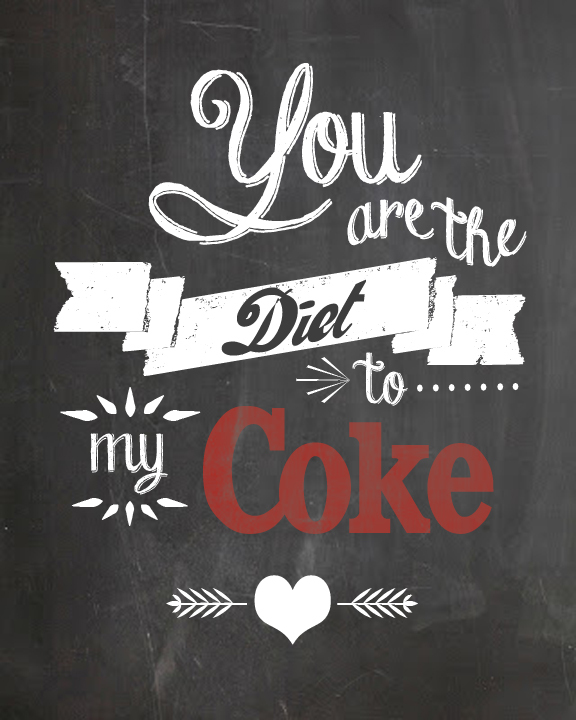 Check out this post for the free printable and her Valentine's Day round-up. 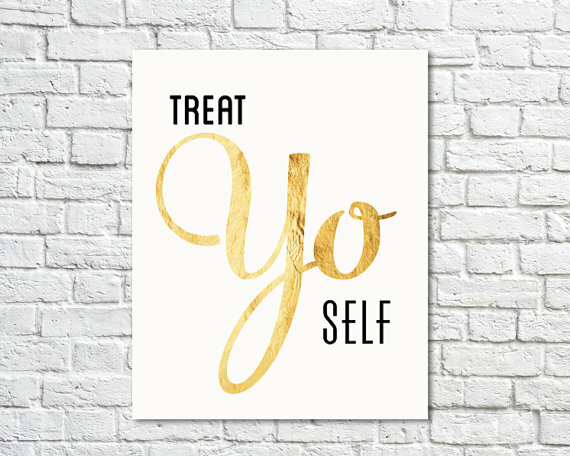 It's almost the weekend, so why not Treat Yo Self? I'd recommend browsing the Paperchat shop to start...so much fun Parks & Rec, Friends, and Seinfeld goodness! 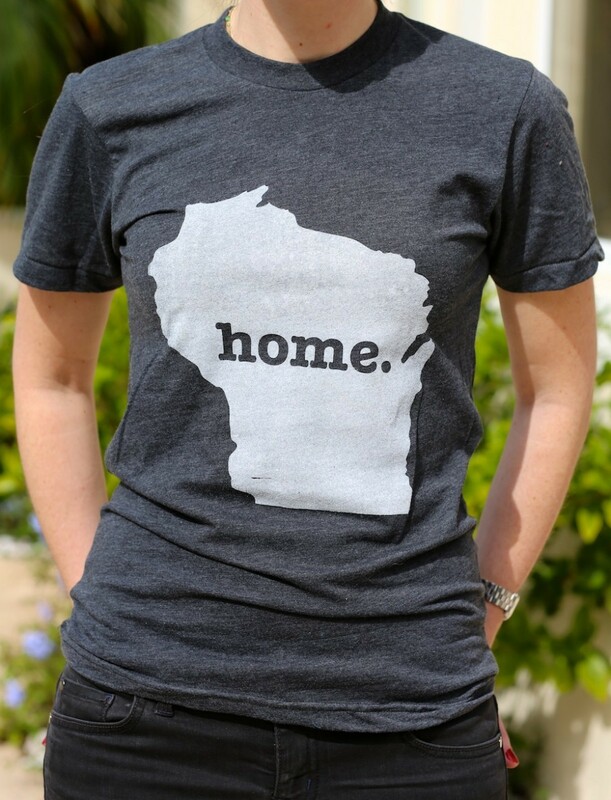 A cute way to show off your home state pride (and a portion of the proceeds goes to MS research as well). Find your state here. 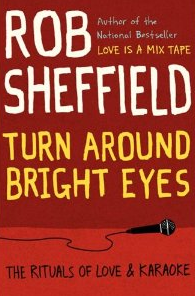 A new book by a Rob Sheffield...he loves 80s music even more than I do (if you can believe it) and his books are always fun reads. I also did some browsing of a different kind...through crochet patterns. I did some gift pattern looking and then decided that I needed to make myself something. So, next thing you know I'm poncho pattern browsing. I now have 3 patterns for myself and some for the girls as well. Don't worry...they are more capelet than 70s granny square. I started this one last night (the pattern is a bit of a bear detail-wise) and I'm getting excited to wear it already. EJ's birthday is coming up so I've been doing some browsing for her wish list as well. 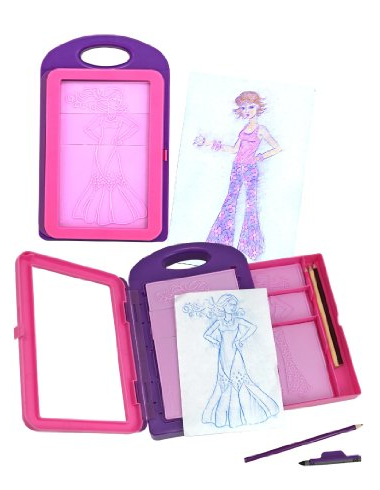 Remember Fashion Plates? They made them again! 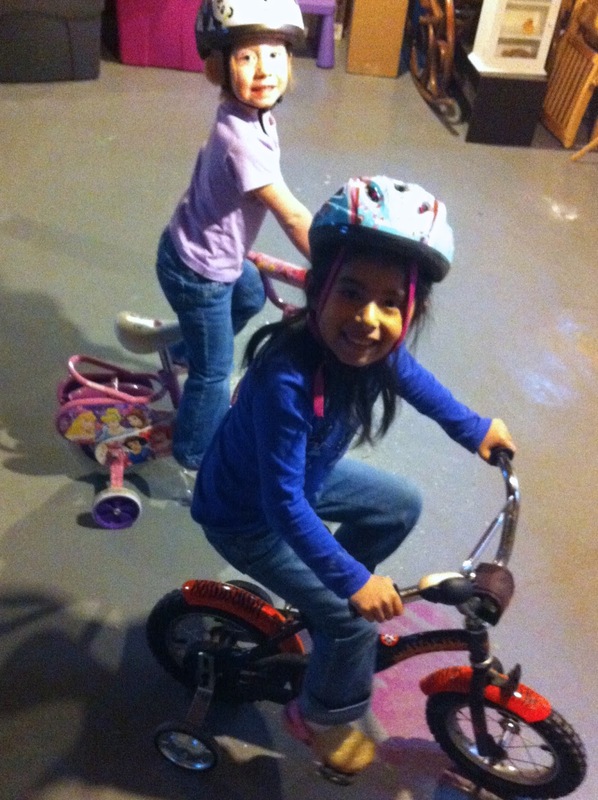 I really hope she gets them, so I can play with them (with her of course)! 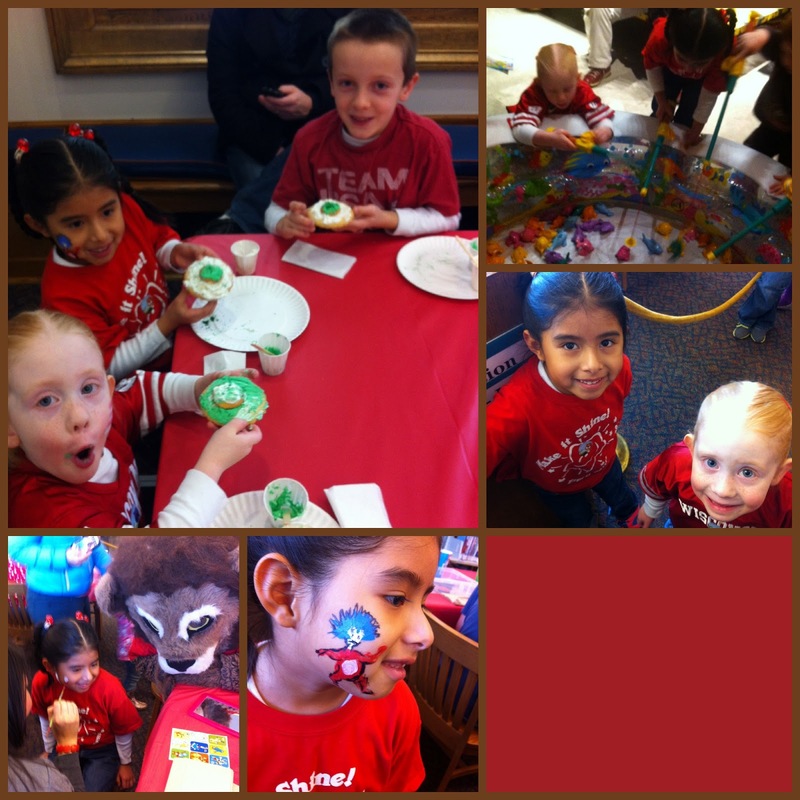 The library threw a birthday party for Dr. Suess and invited the whole city. We went once before, but if you check out the pics in this post, you'll see that Liv was much too young to remember. I wouldn't have guessed it was 3 years ago. At any rate, the girls had a blast and Jack hung in there (spent his time guessing how many swedish fish were in a bowl & holding out for cookie-making time). 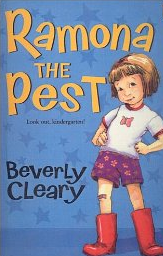 Happy Birthday to Livie's current favorite author! It's been such a weird Winter this year. While I truly appreciate the snow and then warm streaks immediately after, it's not the norm around here. 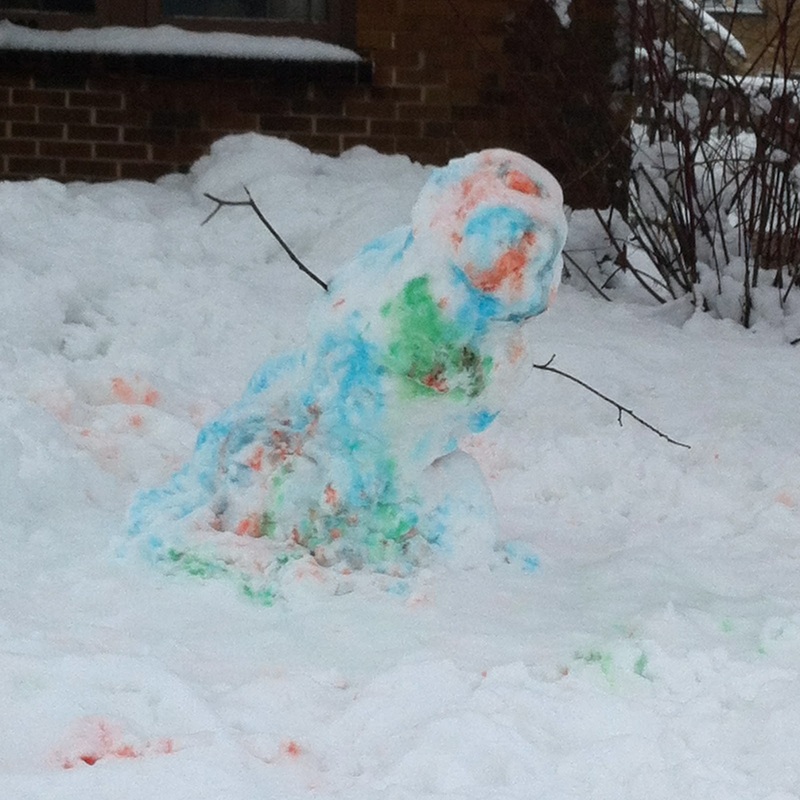 It is nice not to have the dirty snow hanging out for weeks (and making everything depressing), but it makes your snowman get a little bendy the next day. The kids had a snow day (I'm still not sure exactly why as the snow wasn't that bad), so they got some outside time in the snow. EJ kept me company while I shoveled. She made a fort, pretended she was a pirate captain, a baker, an artist, and a giant. She cracks me up! 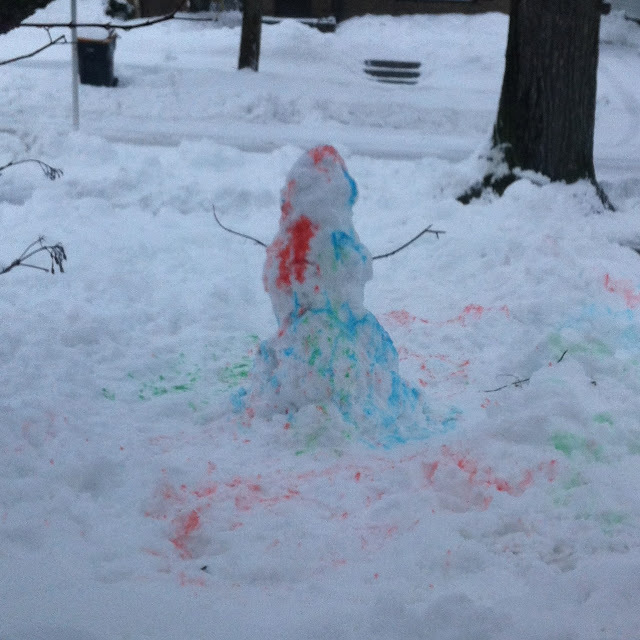 The kids also had a lot of fun with EJ's snow paint (gift from Grandma). Matt thinks the snowman looks like a crime scene. I think it looks like a snow cone. I've been working a bit on the basement again (the clean-up project that never gets done) and Jack helped me a bunch during Liv's nap time We were able to clear enough space (ignore the background, I cropped it for minimal embarrassment that the girls now have an indoor space to blow off some steam as well this Winter. So far, no injuries!